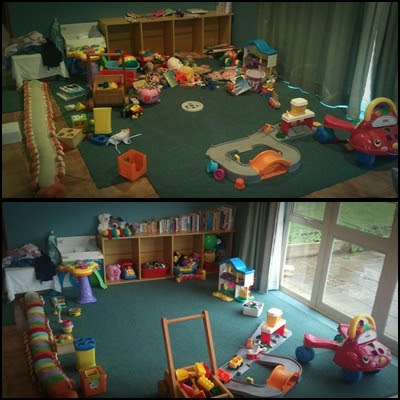 Anyone who has had a young child or two, will understand the above chaos... urghhh! This is a regular sight in our house, and I try to tidy it at least once a day (generally after they have gone to bed for the night); but sometimes I am to exhausted to even care! I think this had been one of those times - quite possibly a two-day-hurricane!!!!! I'm so jealous that you have this space for your kids ;o) Don't you just love how they can sweep e.v.e.r.y.t.h.i.n.g off the shelves, even though they don't want anything from them//! Isn't it nice to have it tidy, even if only for a few minutes? Nice too, to know the kids enjoy using it so much. No doubt it will be my turn to tidy soon :-).